When one hears music discussed in regards to "vibes" and "spirits," it's usually just a pretentious put-on; modern posers trying to resurrect a long-last studio magic. Unless, that is, you're talking about The Lifeforce Trio out of Los Angeles. The vibes and spirits at play on Living Room are very much the real thing: Sly's funk and energy, Sun Ra's spacey jazz genius, the manic passion of 'Trane (Alice and John), and most of all Nino's own coolly effervescent soul. In short: this is a Living Room decorated with generations of musical vibrancy. 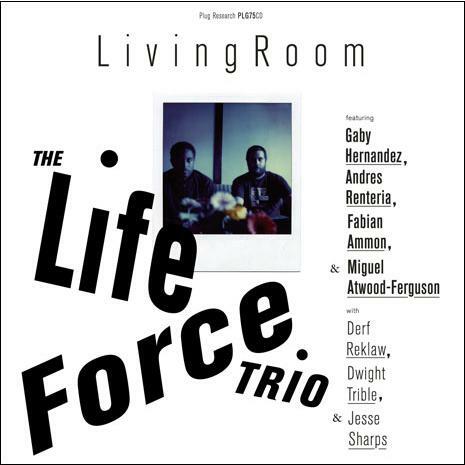 The Life Force Trio was conceived and founded by Carlos Niño (Ammoncontact, Build An Ark, Hu Vibrational, The Sound Of L.A. . . .) when he started production on celebrated soul-jazz singer Dwight Trible's Love Is The Answer in Summer of 2003. Enlisting multi-instrumentalist/songwriter and fellow Aquarian Dexter Story to be his partner in the project, Niño set out to create a progressive new sound. Many have asked who the third member of the trio is and Niño's answer is always the same, "the third member is floating." When Love Is The Answer was finished, Niño and Story, together with friends and fellow musicians, started recording sketches for a new project. The writing process was quick and spontaneous. Within several weeks, Niño started fine-tuning what would become Living Room. "Sly & The Family Stone's There's A Riot Goin' On and Fresh, Shuggie Otis's Inspiration Information, Sun Ra, John & Alice Coltrane and everything from French Impressionism to African High-Life and '60s Space Rock - to me, that's the vibration we were tuned to making Living Room," Niño mentions. "We just got together and made music that was open and from the heart. We all wrote music and/or directed the flow of a jam session, creating a very collective exchange," Niño adds. The "all" that Niño reffers to are multi-instrumentalists Miguel Atwood-Ferguson, Andres Renteria and Gaby Hernandez, along with Niño's Ammoncontact partner Fabian Ammon and special guests, Derf Reklaw, Dwight Trible and Jesse Sharps. Recorded by Niño in his Echo Park living room, and mixed by Elvin "Nobody" Estela with Niño in Nobody's bedroom studio, Living Room in Niño's words, "is a raw, spiritual journey on an elevator to a higher realm, with no enclosure - there's no chance of falling… it's like the wind." Choose a Format: -- Please Select -- CD (Jewel Case) Vinyl 12"